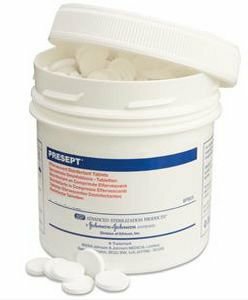 Presept Tablets are effervescent disinfectant tablets and are used for disinfecting working surfaces, utensils, glassware and equipment in maternity units, nurseries, surgeries and laboratories together with general hospital disinfection. Presept Tablets produce a rapid acting, wide spectrum disinfectant solution effective against all vegetative bacteria, fungi, viruses and bacterial spores. Follow all instructions on the packaging carefully. Acute oral toxicity data on the preparations indicates that this product need not be classified as harmful. Ingestion of this product will irritate the mouth, oesophagus and other tissues of the digestive system. Symptoms of such overexposure may include vomiting, diarrhoea, and nausea. Do NOT induce vomiting. Wash mouth out thoroughly with at least 500 ml (4 plastic cups) of water and then drink plenty (500 ml) of water or milk. Obtain medical attention if signs of discomfort or ill health. Not considered irritating to skin. Repeated skin contact may cause dermatitis (red, cracked skin) and itching. Symptoms are generally alleviated when exposure ends. lf accidental contact, remove all contaminated clothing and wash affected area with soap and water. lf signs or irritation or discomfort, seek medical attention. irritating to eyes. Direct eye contact with the product may cause stinging, excess tearing, and redness. Rinse immediately with plenty of cold water and continue for at least 15 minutes. Obtain medical advice. Breathing dust or vapour may irritate the nose, throat, or respiratory system. Symptoms of such exposure considered typical for halogens or amines. lf dust or vapour is inhaled, remove to fresh air. lf breathing is difficult, oxygen may be given by qualified personnel. Obtain medical attention if any discomfort. Troclosene sodium is not considered readily biodegradable and is dangerous to aquatic organisms. The active components will chemically degrade and mineralise in the environment and are not considered persistent or bioaccumulative. Use in a well-ventilated area. Do not return any product to container because of the risk of contamination. Do not swallow; avoid contact with eyes and skin. Remove any contaminated clothing and wash before re-use. Handle tablets or granules with dry gloves. When using the solution, avoid formation of spray or aerosols. Store in original container in a dry, well-ventilated, secure place under the conditions indicated on the product label. Store away from all incompatible material. Keep container tightly closed when not in use. lnspect all containers before storage to ensure containers are properly labelled and not damaged. Store separately to combustible material such as paper, wood and textiles. Sodium dichloroisocyanurate, Adipic acid and non-hazardous components.